After a brief but solemn montage depicting the fall of humanity, Dawn of the Planet of the Apes opens with a close-up of an ape’s eyes. Immediately, we’re struck by their intense focus, confident majesty, and peaceful resolve. A marvel of CG technology, the peepers somehow manage to capture a full state of being, catching us up in a single shot with our simian protagonist, Caesar (Andy Serkis), who led his species to freedom in Rise of the Planet of the Apes (2011) and now carries the burden of ensuring civilisation lives on without man. A decade has passed since the spread of the deadly ALZ-113 virus, and humans have seemingly disappeared, allowing our hero’s community to prosper and build its own city cleverly reminiscent of the one Charlton Heston encounters in the original Planet of the Apes (1968). I love the details of the burgeoning ape culture in Dawn of the Planet of the Apes, the way, for example, the three mantras inscribed near the younglings’ corner reflect Caesar’s idealistic upbringing with the Rodmans in the previous film: “Ape not kill ape. Apes together strong. Knowledge is…” Ironically, that last bit is obscured by Maurice the Orangutan (Karin Konoval), who appears to have taken the role of educator. I love Maurice by the way, how he and Caesar wax philosophy before every important decision. Dawn of the Planet of the Apes wisely limits the apes’ mastery of English even in their subtitled sign language, providing them with a more condensed, oddly poetic syntax, sort of like conversational haikus. “Did not have your experience of humans,” muses the circus orangutan, “Only their bad side.” “Good, bad, doesn’t matter now,” his friend replies, “They destroyed each other.” The exchange doesn’t just showcase Caesar’s complex grasp of the human condition but also Maurice’s wisdom in recognising that the truth isn’t restricted to his perspective. Let’s look at the wider implications of this statement. 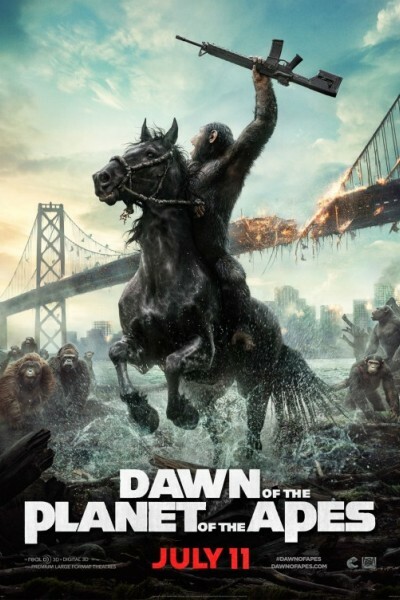 Dawn of the Planet of the Apes argues that we, as intelligent beings, are not just defined by our experiences but by what we choose to take from them. Consider the lesson Caesar derives from Koba’s eventual betrayal, the unexpected depth and humility of his thought process: “My fault. I trust Koba because I think ape better than man. Now I realise how alike we are.” By the same token, the human survivors’ two leaders draw very different conclusions from the apes’ early attempt at peaceful intimidation. Whereas Dreyfus (Gary Oldman) views Caesar’s army as a threat to his own fading way of life, Malcolm (Jason Clarke) sees the simian community as potential new allies in these harsh times. Some will draw direct comparisons to American foreign policy, especially when Dreyfus starts stockpiling weapons with which to invade the ape city because “we need fuel!” I think Reeves and his screenwriters paint in broader strokes, but the parallels are present, owing to Dawn of the Planet of the Apes exposing our natural aptitude for corruption. Take, for instance, the way Carver (Kirk Acevedo) justifies his bigotry toward apes by calling ALZ-113 the “simian flu”. The rhetorical fallacy made me realise something about our own institutional use of the “other”: we call H7N9 the Chinese bird flu but never refer to BSE as the British mad cow disease. 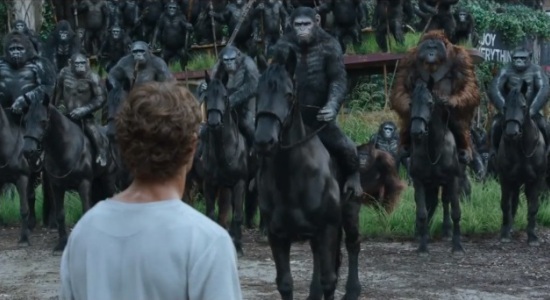 It’s worth noting, though, that the human characters in Dawn of the Planet of the Apes are solely defined by their relationship to our simian protagonist, including Will Rodman (James Franco), whose fate after Rise of the Planet of the Apes is never addressed. I find it interesting how Reeves keeps pushing back Caesar’s remembrance of Will, teasing it every once in a while as if to build up emotional suspense. The fact that the young scientist is technically responsible for wiping out humanity is never brought up because it doesn’t pertain to our hero’s journey. By the same token, consider how little we learn about Malcolm’s people in Dawn of the Planet of the Apes. When tensions escalate into a full-scale assault on San Francisco, we find ourselves less concerned with the human survivors than how Caesar is going to get out of this mess. Incidentally, the solution involves a devastating bit of hypocrisy that I fear viewers will interpret as a plot contrivance à la Batman Begins (2005) rather than the first of many moral compromises to ensure the survival of a species. After all, Dawn of the Planet of the Apes ends with a close-up of Caesar’s eyes. Immediately, we’re struck by their quiet uncertainty, subdued remorse, and somber resignation. A marvel of cinematic storytelling, the peepers somehow manage to capture a profound state of awareness, communicating in a single shot the existential angst inherent to our hero’s realisation: knowing neither right nor wrong, civilisation, like extinction, is just another cruel part of the evolutionary process.